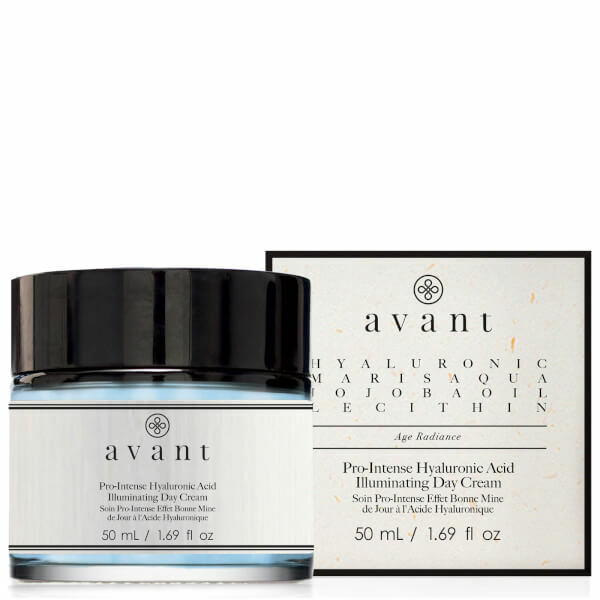 Revitalise mature, dry skin with the Pro-Intense Hyaluronic Acid Illuminating Day Cream from Avant Skincare; a brand that utilise natural ingredients and carefully selected science-based actives for maximum efficacy. Harnessing the powers of Hyaluronic Acid and Sea Water (packed with Magnesium, Potassium and Calcium), the lightweight, quick-absorbing moisturiser delivers long-lasting hydration, whilst combating uneven skin tone and restoring youthful luminosity. Jojoba Oil is combined with emollient Soy Lecithin to soften and soothe skin. Penetrating deep into skin, the anti-ageing formula helps to minimise the appearance of fine lines and wrinkles for a smoother, more refined complexion. 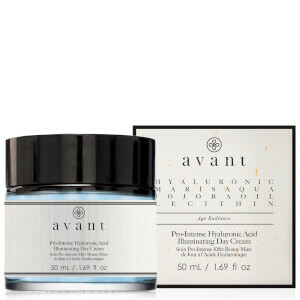 Skin is radiant and rejuvenated without greasy residue. Combine with eye serum or cream for a complete routine.